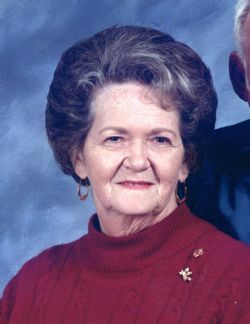 Joanne Wilson Markwardt, or Meme as she was known to her grandchildren as well as many others, age 83, went to be with her Lord and Savior, Saturday, April 13, 2019. Joanne was born in Big Sandy, Texas on October 28, 1935 to Artie Avoy Wilson and Aldine Gray Wilson. She graduated from Brazosport High School in 1954, where she met the love of her life, Calvin L. Markwardt. They married on July 2, 1955. To the marriage, four wonderful children were born, Calvin Jr., David, Barry and Karen. Calvin stood daily by her side during her lengthy illness, with much compassion and faithful love. She was a loving wife, mother, grandmother and friend. Her kindness, friendly smile, and compassion were just a few of her special qualities. Joanne retired from BISD tax office and administration after 25 years of dedicated service. After retirement, she joined her husband, working along beside him at Calvin’s Marine, until her illness no longer allowed her to continue. She was preceded in death by her parents brother, Sonny Avoy Wilson sons, Calvin Louis Markwardt Jr. and Barry Joe Markwardt and daughter-in-law, Mitzi Dean Markwardt. Survivors include her husband of 63 years, Calvin L Markwardt children, David Markwardt and Karen (Ken) McGehee and Amber (Clayton) Bock her precious great granddaughter, Saylor Keith and great grandsons, Hunter and Reed McGehee, Jase and Caleb Bock brother, John (Bonnie) Wilson brother-in-law, Herbert Markwardt sisters-in-law, Shirley Veach, Norma (Dave) Goodson and Joyce Markwardt special niece, Tiffany (John) Newman and many nieces and nephews. Pallbearers will be Benny Lewis, Jamison Keith, Shayne McGehee, Mark Paladino, Matt Paladino, and Andrew Jimenez. Honorary pallbearers are Ken McGehee, Mike Paladino, Mark Dean and Clayton Bock. The family will receive friends and relatives, Tuesday, April 16, 2019 from 6 to 8 p.m. at Lakewood Funeral Chapel, Lake Jackson with services Wednesday, April 17 at 2:00 p.m. at St. Mark Lutheran Church, Lake Jackson. Pastor Terry Adamson will officiate. In lieu of flowers, contributions in her memory can be made to St. Mark Lutheran Church, His Love Christian Counseling or a charity of your choice. The family would like to extend a heartfelt thank you for the compassionate care taken of our loved one to Creekside Nursing Home, Revered Texan and A-Med Hospice.